Face it, you probably make boring presentations. And, it’s not even me who says it but statistics. Even though 70 percent of recently interviewed American workers consider presentations critical to their success at work, the majority admitted doing something else what, like texting (28 percent), checking emails (27 percent), and finally, falling asleep (17 percent). Another research added that 8 percent of the audience has been so unengaged by a business presentation, they went to browse through a dating app. Isn’t it a true presentational failure? Many of us worry that we look too nervous on the stage, forget the speech, or bore people to death. I get it but stop and listen. Firstly, focus on what you strive to accomplish. Pitch an idea? Inform? Motivate? Persuade? Also, nothing bores people more than listening to something they already know or causes more misunderstanding than assuming they know the jargon and acronyms you know. Keep your content a priority. A truly good presentation starts not with slides but a pencil and a paper (or a Google Doc for notes, whatever suits you). Get insights into your audience’s background, capabilities, and passions. Gather your material and know as much as you can about the topic. Then, design it to fit your audience’s preferences to make sure it’s not only engaging but relevant to their interests. Think of your presentation as a gift to your audience. Would you buy the same gift for a sister and your eccentric uncle? Exactly. So, why would you assume that each audience is the same? “The biggest problem I see in first drafts of presentations is that they try to cover too much ground”, – says Chris Anderson, the owner of Ted Talks. And, that’s so right. We try to share all the knowledge we have on the topic during one speech, but that’s impossible. Limit the scope of your talk to what can be explained and enhanced by examples in the time given to you. Outlining will help to structure your content, as well as the time needed for each content piece. Not to forget, leave some time for transitions, giving your audience a chance to smoothly shift to your next idea. And take the 10/20/30 rule by Guy Kawasaki into account. Have around 10 slides, because an average person simply can’t comprehend more than 10 concepts. Then, make sure to present those slides in 20 minutes and leave some extra time for the Q&A session. Lastly, don’t use a font less than of 30 points or ‘find out the age of the oldest person in your audience and divide it by two’, as suggested by Guy Kawasaki. Read through your presentation again, check for details that you can do without, delete them, and continue editing. If you still need to add more content, consider including handouts. In the modern attention-scarce society, engaging your audience is a huge issue for any business worldwide. It doesn’t only cost you money and time, it costs you the attention of your audience, which is priceless. Microsoft’s previously wildly successful ‘presentation’ platform is now a destructive lullaby for any public speaking. How come? According to recent research done by Harvard University, PowerPoint is harming people’s perception of you and your brand. Using a real business case, PowerPoint was rated as no better than presentations without any visual aid at all. So, does wasting all the money, efforts and time worth the PowerPoint outcome? Definitely not. It’s hurting your company more than helps. ZUIs (zoomable user interfaces) that can be created through animation and transitions were found to be far more effective, engaging and persuasive, making a presenter seem ‘more knowledgeable and professional’. 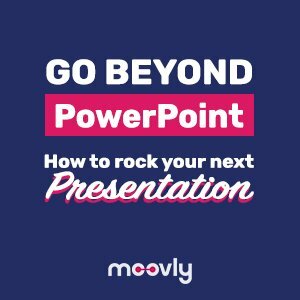 The major reason why PowerPoint has lost its ability to deliver information in a powerful way is in its nature that just stopped fitting the communication of the modern society. PowerPoint’s linear format is not designed for an audience raised on moving visuals, viral videos and animation. Video presentations can either be showcased in a video format or through a visual slide accompaniment like here. Such a presentation is divided into slides by multiple pause points (or stops) where video content automatically stops to give a presenter time for the further explanation. With a visual help, everyone will benefit: you can communicate more with less. Take advantage of visuals, transitions, and animations to illustrate processes, concepts, movement, or growth, which often takes too long to explain verbally. Don’t put your audience’s attention at risk by explaining the concept too long or cramming too much information into the slides. 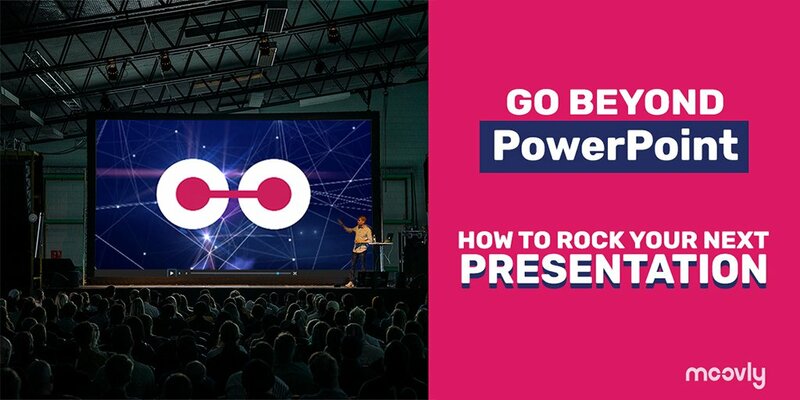 Break the monotony of conventional PowerPoint by adding animation and visual effects to reinforce a message, making it more distinct and memorable. To make sure you nail the delivery of your presentation, keep on practicing. Your content truly matters, but your confidence in your content will make an impact as well. Brent Schlender, the co-author of “Becoming Steve Jobs”, mentioned that Jobs would spend months rehearsing for his public appearances. It’s not just a talent, it’s about your hard work. Schlender said: “I once spent an entire day watching him run through multiple rehearsals of a single presentation, tweaking everything from the color and angle of certain spotlights to editing and rearranging the order of the keynote presentation slides to improve his pacing”. Remember, slides are used to convey your concept that you as a speaker will walk the audience through. The slides don’t carry the entire content, that’s your job. So, stop with your slide-reading dependency. Don’t read your slides, it’s too distancing. When people sense you’re reading, you lose this close connection you’ve built, and everything becomes more formal and played out. Be extremely clear what’s your main point of the speech, and what value do these findings bring to the audience. Keep it concise and to the point. Think about it: when you’ve had a truly filling full meal, you don’t really have room to repeat it right away. Therefore, don’t overload your listeners until they’re stuffed. Make sure to tell them upfront what do you want from them, so they save some room for the end. Remember that, ultimately, it’s all about you! Well-prepared presenters will make sure to avoid the first symptom of Death by PowerPoint, being a speaker who read his or her own slides. Don’t be a tool and tell your story with a confident physical presence. Good posture and body language can help you hide nervousness or any insecurity. Finally, there’s nothing more awkward than the situation when audience not knowing when to clap, or when the presentation ends. Therefore, make sure to leave with a clear and memorable grand finale. Finalize your talk with an important idea, quote or even a rhetorical question. Leave your audience thinking. Inform, educate, motivate and inspire your audience with a presentation. Whether you’re performing a training, showcasing financials, conducting a yearly summary, pitching an idea, presenting an assignment, or teaching a class, creating a presentation is the way to go. Learn how to create effective, persuasive, and engaging video presentations here. Now, it’s easy to support your presentation with professional-looking animation, numerous multimedia files, transitions and customizable video effects. See for yourself! Avoid Death by PowerPoint by following these 5 major steps to a killer presentation. Check out this blog to know the top tips for effective presentations. Wake your audience up!